Find all you need to know in Lighting magazine. Products and solutions for every room, from your entry to your living area and powder room too, can be found in Lighting magazine. For example, when lighting your entry area, don’t just concentrate on the inside lighting. The lighting outside your entry area, as well as the way the inside light is seen from outside your home, combine to create your home’s welcoming appeal. Be sure to direct some of the outside light downward to illuminate walking paths. And once inside, provide some overhead light to eliminate unwelcoming shadows. Keep in mind that light that shines upward or directly toward people’s eyes can create uncomfortable glare. In the living area, whether enjoying family time or entertaining, proper lighting makes every activity more enjoyable and aesthetically pleasing. An important element to a perfectly lit living area is proportion. Add the number of feet in your room’s length, width and height. That number (in feet) should be approximately the same as the number of inches of your light fixture’s height. Also, that fixture should hang 78-84 inches from the floor (as measured from the bottom of the fixture). Sooner or later, some of your guests will visit the powder room. Everyone feels better when they like what they see in the mirror, so choose light bulbs that flatter skin tones. And fixtures with an unexpected pop of texture and pattern can turn an otherwise ordinary space into an interesting private retreat. 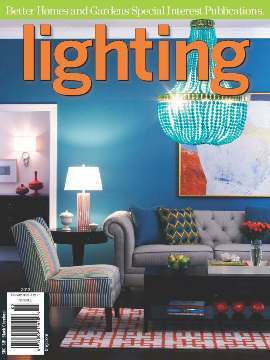 For much more about how to light every room in your home, check out the new 2013 issue of Better Homes & Gardens’ Lighting magazine. You can browse the magazine online, or order a complimentary copy from ALA.
For more lightbulb tips, order your free copy of Lighting magazine, or view the magazine online. More lightbulb facts are available at lumennow.org or energy.gov. What kind of LED bulb is best to replace a 50-watt flood in a three-inch can light? I need to change 17 of these bulbs, so I’m looking for a cost-efficient option. Experts recommend a medium-base PAR20 LED replacement bulb with the highest wattage available. You may want to buy one and give it a try before buying all 17 bulbs. There are many variations from one bulb manufacturer to another. Therefore, you might want to purchase several different brands to try out, and return those that do not provide adequate lighting.